This week features Lori Jackson, a La Harpe native. Lori graduated from La Harpe High School in 1988 and says "Go Eagles!" Her parents are Roger and Marilyn Jackson of La Harpe and Ann (Link) Carrel of DeKalb. Lori has one sibling, Gary Jackson, of Carthage. Lori obtained her B.S. degree in Mathematics, with an emphasis in Probability & Statistics, from Northern Illinois University in 2000. She furthered her education with an M.B.A. degree from Northern Illinois University in December 2017. She is currently living in Cherry Valley, Illinois and is employed as Senior Manager, Quality Validation, for PCI Pharma Services. PCI Pharma Services is a contract pharmaceutical packager. Their corporate headquarters are in Philadelphia, Pennsylvania. 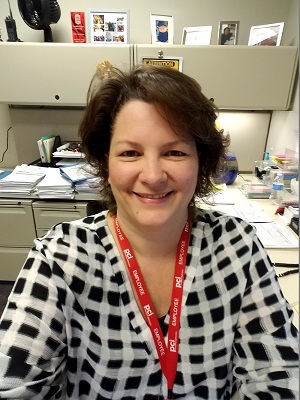 Lori oversees validation activities for all packaging equipment, computer systems and facilities for all sites in Rockford, Illinois. They currently have 8 locations in Rockford. Her department is responsible for making sure the equipment and systems used for packaging produce a quality product without jeopardizing the efficacy of the drug and the final product is safe to the consumer. She is also working with their counterparts in Pennsylvania, Ireland and UK to develop global standards for all validation activities across all PCI sites. Prior to PCI, Lori worked at Nissan Forklift (now UniCarriers Americas). She was a Project Manager for the Corporate Strategy department. She oversaw the vendor selection and implementation of their new ERP system; managed all operational activities related to the merger between Nissan Forklift and TCM; led an international cross-functional team to improve ordering processes for their existing Latin America dealers; and optimized NAFTA related activities for the Mexico subsidiary. Lori has had several opportunities to travel abroad and she says all have been great experiences. She loved Vienna and has visited the Schonbrunn Palace and the Lipizzan horses at the Spanish Riding School. She has been to Athens and stood on the rock where Apostle Paul delivered a sermon. She has also been to Lisbon, Istanbul and Budapest, as well and states they are all beautiful cities. She recently returned from UK and Ireland for work. She and her husband just got back from Mardi Gras and also spent time in Barcelona and Paris last March. Lori married Derrick Lander in June, 2015. She has two children, Alexis (25) and Dylan (21), and two step-children, Brianna (21) and Cain (19). Alexis and Matthew Paulsen live in Clare, Illinois and have a son, Freddie, who will turn 2 in April and they are expecting a baby boy in May. Alexis is a bank teller and Matthew is a farm manager. Dylan and Jasmine Hauck live in Junction City, Kansas and have a daughter, Makayla, who will turn 2 in July. Both Dylan and Jasmine are in the Army stationed at Ft. Riley, KS. Dylan is a Blackhawk helicopter mechanic and Jasmine is in Human Resources. Brianna Lander works in Joliet at Amazon Distribution Center and Cain Lander is getting ready to leave for boot camp and join the Marines. Lori's hobbies include reading and spending time with the grandkids. She is trying to learn how to crochet and knit, but says she is not getting the hang of it! Lori and her husband are currently in the process of establishing a new Lions Club in their community. They had been members in their previous community, but when they moved this past September and wanted to join, there was not a local club. Lori was contacted by their District Governor to start a new club. Lions Club International is the largest service organization in the world with over 1.4 million members in 210 countries. They do great things for your local community and she encourages everyone to get involved. When asked about a most influential person or teacher, Lori says her grandmother June Jackson was her most influential person. Most influential teachers (she says so many from La Harpe) include Janet McKoon, Pat Boyer, Marta Logan, Mildred Bavery, and Diana Sharpe. Lori says "Thinking about this, I never realized how fortunate I was to have so many strong, influential women in my life - family, teachers, ladies from the church (Henrietta Finch, Rachel Neff, Bertha Sparrow), neighbors (Eleanor Sears, Sally Rasmussen), mothers of my classmates (Carol Selmon, Connie Kraft), etc. Growing up in a small town definitely has its advantages - it's not just your family's influence that shapes the person you become, but the entire community's influence".